I was in the sewing mood the other day which is odd. I rarely get the urge to sew. My sewing skills are very limited. I can sew a straight line but that's the extent of it. It has always been my desire to improve my skills so every now and then I try to take on a project that involves sewing. I came across these charm packs on Etsy a few weeks ago while searching for vintage sheets. I love, love, love vintage sheets. I have a small collection of them. They come in great patterns and colors. What's not to love about them? So when I saw these pre-cut five inch squares on Etsy I went ahead and bought them knowing I could do something neat with them. I immediately thought they would make a darling baby quilt. I happen to know someone at church that is expecting a girl so I already have someone in mind to gift it to. I didn't really have a plan about how to put the quilt together. I thought maybe if I could just get it started I could figure it out along the way. 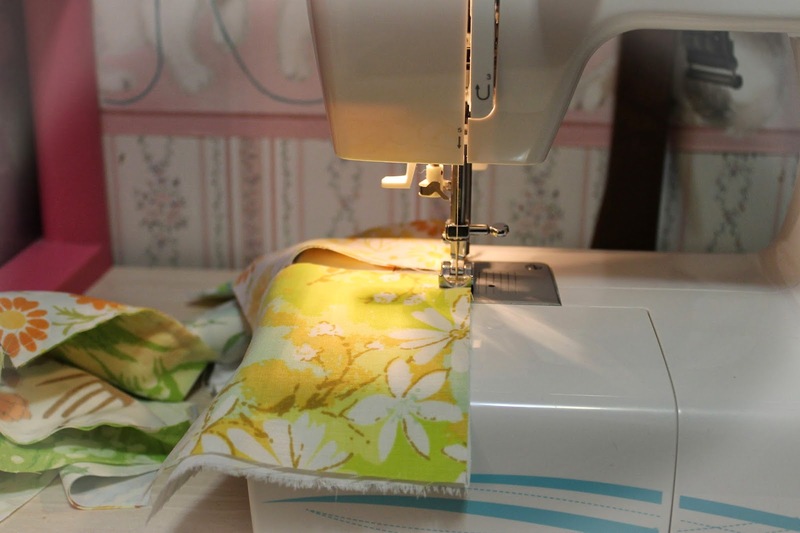 I knew the first step was sewing all the pieces together. Easy enough... I can handle that. of the same pieces side to side. I like the unplanned, random look to the squares. It pretty much ended up the way I imagined. There's only one thing I'm not completely happy with. You may not be able to tell from the pic but a lot of my corners don't line up. They're off by just a little bit. I'm debating whether I should leave it or rip out all the stitches and try it again. I don't know why I thought this was going to be easy. It rarely ever is when it involves sewing. I think that's probably why I stay away from it so much. Every time I try and do something I end up ripping it out and starting over. I don't know why it bothers me. I wasn't expecting perfection. I wanted it to have the vintage hand made look. I happen to find that look very charming. I just don't want it to scream "amateur". I have a quilter friend at church so I'll show it to her and ask her a few questions before I rip it out. so I have time. I'll get it done eventually. It just might take me a while. 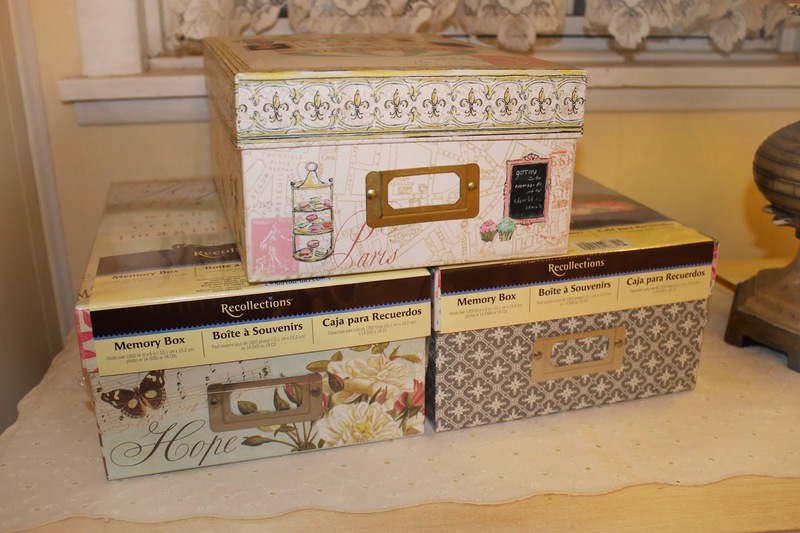 On another note, I totally love these boxes I bought at Michael's this weekend. They were on sale six for ten dollars. They're supposed to be photo boxes but you can use them for so many more things than photos. Basically it's like a big sturdy shoe box, only cuter. I haven't filled mine with anything yet but I know it's only a matter of time before they are full. Whew! Finally! Our house is on the market. We are praying for the Lord to send us the right buyer so we can sell it quickly. I've known we were going to move since October. The plan was to put the house up for sale in the Spring. I've taken the last few months to emotionally detach myself from my house. I've packed away family photos and a lot of our belongings are already in boxes. I was sad about giving up my house in the beginning but now I'm ready to go. I'm tired of the transition mode we've been living in and I just want to sell the house and go. I'm looking forward to living in the parsonage in New Mexico. The house is out behind the church building and its right outside the city limits, so I'm looking forward to having chickens and growing a garden. I love my house here but sometimes God leads us places we never thought we'd end up. We just have to be willing to follow. I think your sewing skills are just fine. I adore that fabric!!! Love the boxes you got at Michael's. I actually use those for nest boxes in my coop. I have 4 nest boxes, and they all prefer the Michael's box. Silly hens. Good luck with the sale of you home, and move. Love the randomness of your patchwork! Those vintage charm packs are terrific. I do love those decorative boxes at Michael's. Oh I know how you feel when you feel when you are trying to work on something and then it doesn't look right. I think that you did a really good job! It's a good idea to ask your friend advice though. I hope all goes well and your house sells quickly. Have a good afternoon. Moving is not easy to do. The only way I am moving again is when they haul me off. I wish you the best in this endeavor. In time, things will work out for the best. I love quilts, but never attempted to make one. You did fine on this little project. Stay in touch. Good luck with the house sale. I have just got back from America and was so tempted by the boxes myself but opted for yards and yards of fabric from Joann's instead. You have done really well with the quilt, its the love making it that counts. 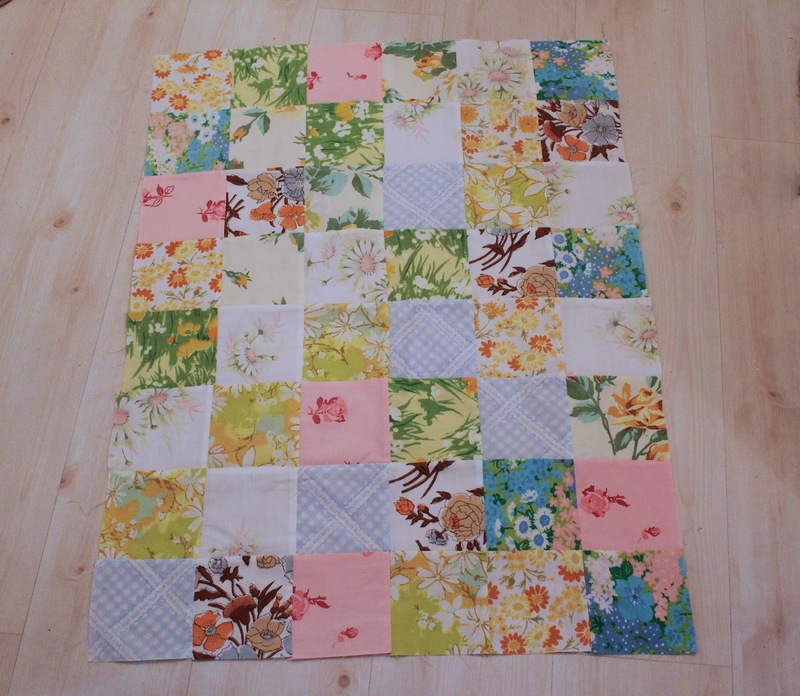 I love your sweet patchwork! 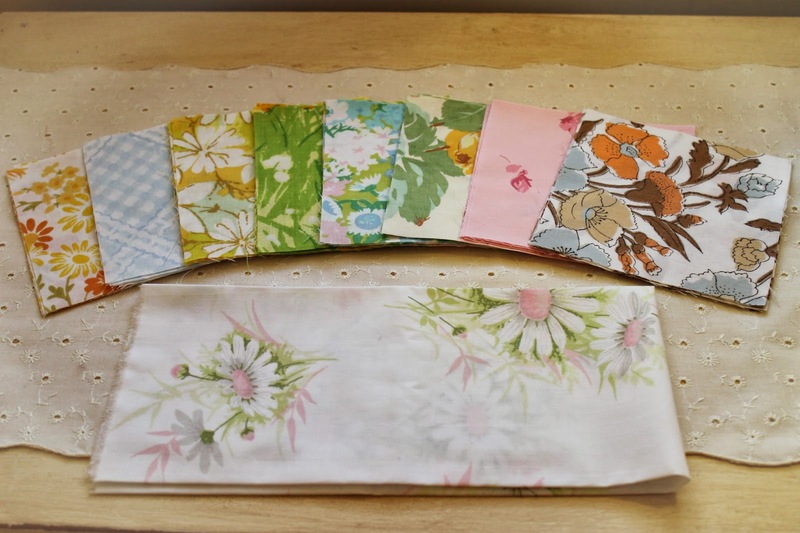 I love the fact you have used vintage sheet pieces, they are so much more charming than a set of perfectly matched new fabrics in carefully co-ordinated colours. I personally don't think you should rip it out at all unless it really bugs you - from what i can see they look pretty neat to me, and if the odd corner isnt perfect then that just adds to the charm. It's the thought that counts, and the love and care you are putting into the making of something for someone else. I know just how you feel about moving, and i did the same when we moved a couple of years back - packed away a lot of personal stuff made the house less our home but made it look better for sale and eased the transition of detaching yourself - so hard when you've lived somewhere a long time with all the memories in the home. Good luck with both the quilt and the move Beka! That's great that you felt like sewing and then sewed all those beautiful squares to make a quilt! I haven't tried my hand at sewing yet. I might have to try that along with more crochet ( I've only crocheted a chain so far!). That's great that your house is on the market and you don't have to be in limbo too much longer. Oh this is just lovely. I love the way the fabrics look together. 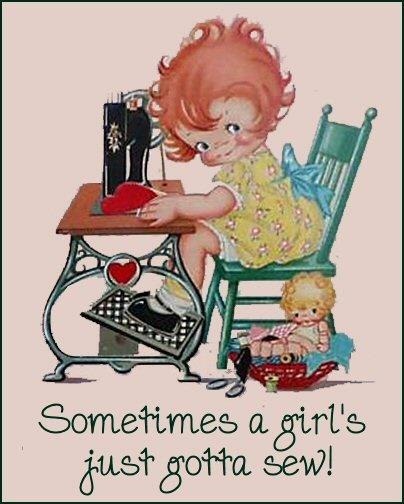 I could have written the exact same things about sewing...I don't know what it is, but I am always ripping it out too. For now, I will stick to crochet. On and BTW I love your crochet edged tags. Very cute! Good luck with selling the house. Lovely fabrics....cute...have a great week.